Decorating an office can be a balancing act, especially if you are on a budget. It is important to create and maintain a professional look while still creating an inviting and pleasant atmosphere. A well decorated office helps create the look of a successful company. An embellished office can enhance your professional image as well as reflect the company’s standards. First impressions count and the first thing a client or potential client sees when they step into your office is your lobby area. Mismatched tables and chairs tend to make any space look thrown together, so make sure your reception furniture has a cohesive look. This is also true if you entertain clients in your personal office. 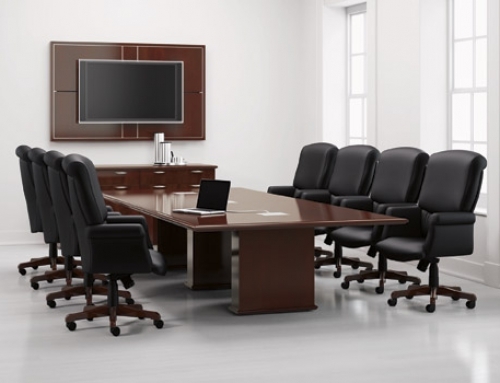 Provide them with comfortable side chairs or a sofa that unifies the look of your office. When choosing sofas and chairs for your office, remember that light colors can show wear more easily, so consider darker colors or patterns. Bare walls can give an office a dull, unlived-in feel, and that energy can affect the mood of your staff and clients. Choosing tasteful artwork will enhance your décor as well as give it a finished look. The artwork you choose to enhance your walls is more than simple decoration. It gives clients an idea of your company’s philosophy and culture. Clean, crisp black-and-white photography can indicate your commitment to detail; bold colorful modern pieces may denote your talent for innovation; and classic paintings with ornate frames can highlight your dedication to tradition. Including plants in your office can also greatly improve the environment. If natural sunlight is unavailable in your office, silk greenery is a good alternative. Adding a rug in your reception area can provide color and can also protect carpeting in high traffic areas. Tabletop lamps can also help pull your look together and are recommended to reduce eyestrain. Choose models that fit your overall style. When furnishing your office, it is important to remember that the finishing touches are what give the office a polished look. McAleer’s has everything to help you create a well decorated office at a price you can afford. We have lamps, artwork, silk greenery, side tables and guest chairs—all the accessories you need to complete your room! Our selection is continuously changing so stop by one of our showrooms to see our newest arrivals and talk to one of our designers about how to decorate your office for success.